Stadler: ""China thinks and lives in long time frames and we've positioned ourselves with this in mind." BEIJING - Audi hopes a second joint venture and new SUVs will help it to remain China's top luxury brand, fighting off strong challenges from Mercedes-Benz and BMW. Audi, which sold just under 598,000 vehicles in China last year, aims to double that volume by 2023, CEO Rupert Stadler said at the auto show here last month. Its growth plans include doubling the number of locally produced models from the current six in the next five years. In addition to its partner of the last 30 years, Volkswagen Group’s northern joint venture, FAW-Volkswagen, Audi also plans to build cars with VW Group's southern joint venture, SAIC-Volkswagen. Stadler said China's passenger car market alone is set to grow by 5 million units to 30 million in the midterm, roughly twice the size of Europe. Currently a tenth of the volume consists of premium cars and Stadler expects this slice of the market to grow more quickly as disposable incomes continue to rise, eventually reaching the 15 percent penetration seen in developed markets such as Europe. 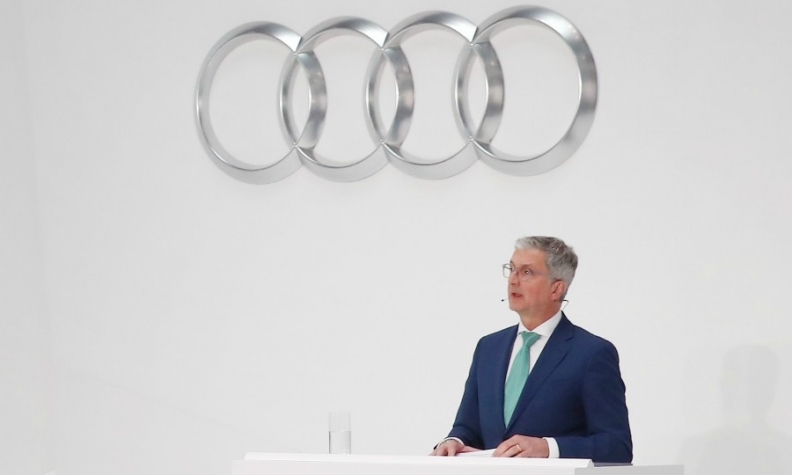 Audi will have to follow with new models and derivatives to service that demand, but Stadler declined to comment on which joint venture might get which vehicles. Audi's sales in China stagnated last year when dealers affiliated to FAW-Volkswagen objected to its plans to also partner with SAIC-Volkswagen. "We will discuss our strategy and allocate the products as part of our negotiations with our partners," Stadler said. "The talks are proceeding well, we have a clear plan and logically it’s timed in sequence with the launch of new products that still have to be developed and localized, so there’s a lead-in time." Stadler hinted that the first Audi models that could be built SAIC-Volkswagen would first come at the start of the next decade. In the first quarter, Audi lost its luxury lead to Mercedes-Benz, whose sales through March advanced 17 percent to 169,932 vehicles. Audi's volume increased 42 percent to 154,270, although the rise was flattered by a poor performance in the same quarter last year when Audi was in the midst of its dealer dispute. BMW brand sales were up 8 percent to 146,280. Audi was China's top-selling premium brand last year despite full-year sales increasing just 1.1 percent to 597,866. Mercedes brand was No. 2 with sales up 26 percent to 587,868. BMW's brand volume rose 16 percent to 559,270. Asked when Audi would retake leadership of the market from Mercedes, Stadler said the year was still young. He declined to pick a specific year for such a target or provide a sales target beyond cracking the 600,000 mark this year. "China thinks and lives in long time frames and we've positioned ourselves with this in mind," he said. By 2022 Audi plans to launch 10 new SUVs in China including its upcoming new flagship SUV, the Q8, which will have its world debut in the country's high-tech metropolis of Shenzhen in June. "It's a real homage to China that we are showing it here first," Stadler said.